It is rare to find a film that so “neatly,” so thoroughly encapsulates not just a single mode of filmmaking, but the entire Hollywood apparatus and a national (almost international) culture to boot. Yet Avengers: Infinity War is just that: in theory and largely in practice, the culmination of a decade-long franchise, spanning nineteen films and counting, interweaving innumerable plot-lines and characters, all united against a single adversary. By design, the Marvel Cinematic Universe is in no way limited to this, connected as it is in both narrative and fandom terms to a vast comic-book tradition as well as the cultural expectations that come with such a massive enterprise. If it weren’t for the multitude of MCU films yet to come (or that other franchise juggernaut), it might be safe to call this the most hotly anticipated film of the decade, perhaps of the century. So how does a “single” film handle such expectations? The short, only mostly accurate answer: as well as the individual viewer might expect. I can say with a great deal of confidence that much of one’s enjoyment of almost any MCU film, especially one as pointedly summative as this, is directly related to their engagement with the wider mythological universe. Nevertheless, Avengers: Infinity War offers much in the way of determining just how one relates to this film, its franchise, and indeed modern Hollywood at large. Given the innumerable character arcs and narratives that all come to a head in Avengers: Infinity War, it is no surprise that the film is all plot, all spectacle, all the time. But even if the term “propulsive” is perhaps the incorrect adjective to apply to this film, there is a certain lumbering momentum that builds from the very first moment. The movie constructs itself out of the actions of two factions: the twenty-one plus (!) superheroes from Earth and various parts of the galaxy that eventually comprise the Avengers, and Thanos (Josh Brolin), for all intents and purposes the main character, who seeks to restore balance to an overtaxed universe by killing half of the people residing in it. To do so, he seeks to obtain the six Infinity Stones, which individually allow the user to access a specific unfathomable power and together would enable Thanos to achieve his goal with a literal snap of his fingers. It is difficult to accuse Avengers: Infinity War of being anything but urgent, and indeed eager to engineer long-awaited reunions and moments of first contact. 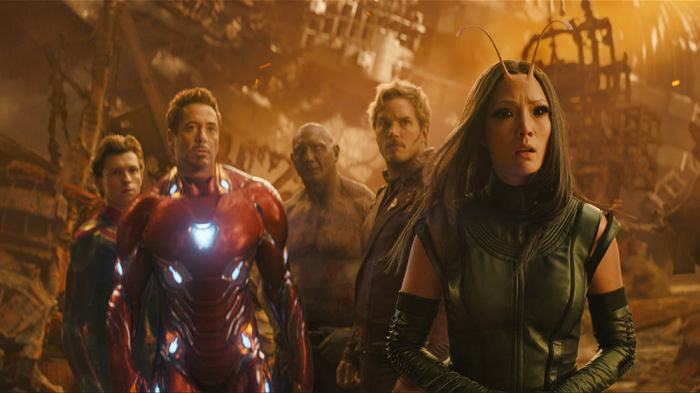 In a curious choice, the film almost proceeds for much of its duration in a quasi-episodic manner: the actions of one subgroup of the Avengers are conveyed mostly in full before the movie jumps to another. Whether this was done in a conscious effort to make the intercutting of the (protracted) climax more effective or simply to avoid overwhelming the viewer can’t be determined, but it is a device that often pays dividends, allowing the moment-to-moment interactions to have a chance to breathe. These moment-to-moment interactions, however, do have many of the same highs and lows that often typify films of the MCU. The insertion of a wisecrack, the recitation of jargon, the emotional plea, the knowing reference: these are tried-and-sometimes-true ploys, and even if they are given more weight than usual when applied to a most dire situation, that still doesn’t fully make them flow in a truly seamless manner. Yet Avengers: Infinity War, by sheer dint of its scenario overload, is able to smooth this into a mildly pleasant, somewhat dull sensorial experience, albeit one conveyed almost exclusively in (slightly more colorful than usual) close-up after close-up; one could quite conceivably reengineer every Hollywood blockbuster out of shots from this, so closely does it hew to the blurred aesthetic standard. All of this, however, is altered radically in the final few minutes. Without explicitly stating the outcome outright, the viewer’s (and my) perspective upon not just this film, but the MCU at large is purposefully disrupted, as an eerie and unfamiliar sensation sets in. 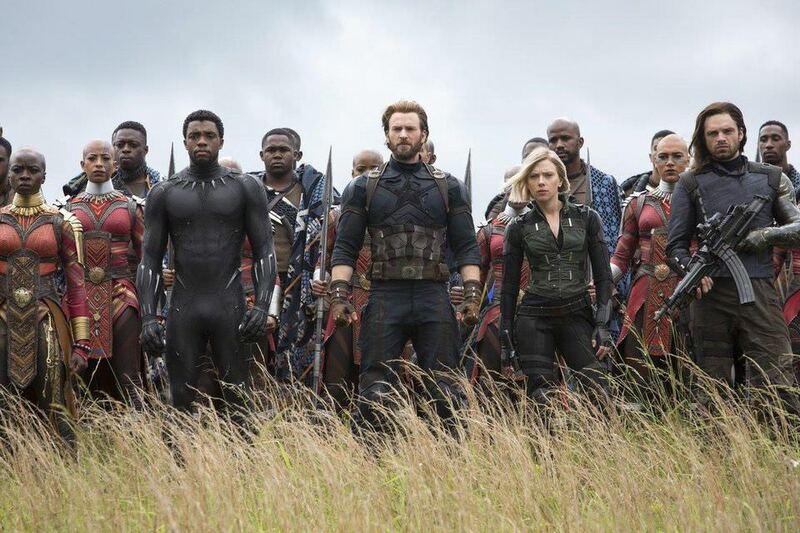 Avengers: Infinity War is certainly the first part of an impending conclusion, but its (and Marvel’s) willingness to go for broke, to commit headlong to a deliberately shocking ending, is something to savor.